Having been permitted the opportunity to experience noh both as performer and observer for a number of years, I can’t really pretend like I understand it. At all. I understand some minor structural aspects of it; some of the more technical or specialist components, but I can’t understand the why or the how of the power it has to impart feelings. There are theoreticians and those of a far more scholarly persuasion than myself that might posit an answer, but I have only dim suspicions. The lack of comprehension was part of my attraction to the form at the outset. Here I was; watching stories that had been written some nearly 600 years ago, in a language I didn’t speak with utterly alien cultural references, halfway across the planet from my home, and yet experiencing an emotional response. Why? How? I don’t know. It seemed unreasonable. There was a universality to some of the stories, yes, but the cultural reference points were entirely medieaval. After time and thought, my only conclusion was that there was something unique underlying the structural detail that had resonance with life itself. 一期一会. Having worn the costumes (the combined weight of some being nearly 10 kilos), the wigs, the mask, increases my profound respect for the performers of the craft. 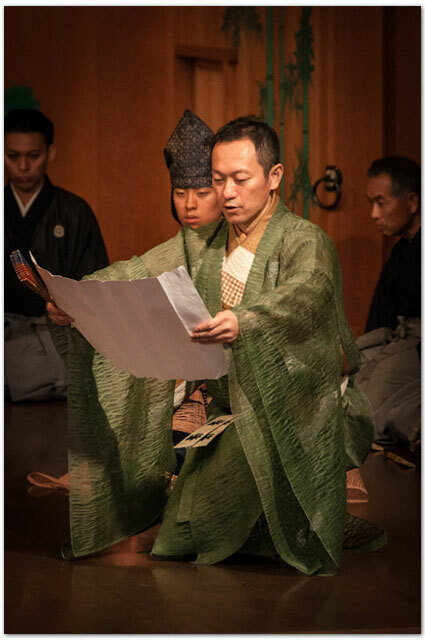 In 2012 I was granted the fortune of performing the mae-shite role in the Noh Training Project takigi-noh performance of Atsumori. The costume was simple (the character was a grass-cutter), and because of the role I didn’t need to wear a mask or wig. Watching the nochi-shite being dressed in full warrior regalia, and already sweating in my far lighter costume, I was empathetic about just what it took to wear something that was so heavy, and so constricted my line of sight. I was grateful for the insight, but truly glad it wasn’t me in that outfit. How is it possible to act, sing or dance with such an encumbrance? My own discovery was that the costumes were not awkward. 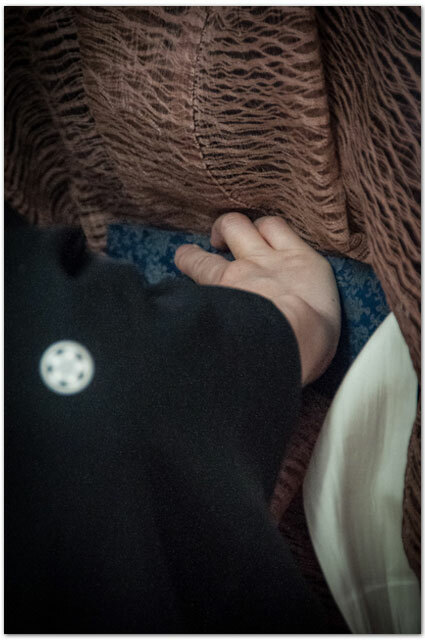 Despite their volume, if the dressers have done a competent job of it the costume feels comfortably snug, and you can sense the way that the fabric compliments the range of movement particular to noh. The mask constrains, yes, but if you truly know the role you don’t actually need to see the whole stage at any given time. In a real way ~ the costume allows you to wear the role. It provides an armature for the character. To don the mask is to support the story. In sum, to not just stand there on the stage lying about who you are but to become, however briefly, another human, angel or demon, or even a god. On June 15, 20014, our group was in attendance at the performance of the Oshima Nohgakudo kai in Fukuyama [福山.] In this portion of the workshop, we moved from the focused microcosm we experienced in the Kyoto classroom (the initial examination of a single thread) to the macrocosm of the world of performance. The plays performed were Kikaigashima (in Kita school, called Shunkan in others) and Kakitsubata. I could offer review, but that isn’t the point just now for me. Maybe later. The point is that we started our study of noh costumes with Monica Bethe’s instruction about small detail: one thread around another, gold leaf affixed to paper and wound around a silk core, lightness and darkness ~ and then moved on to those threads and that gold given shape on the human form. So that we can better understand what it is that those threads may do in our service. That we may serve each other, and give these organic materials another life that, with care, may most certainly outlive us. All in order to tell a story on a stage, to remind us of where we’ve come from, and to ask us where we think we’re going. In looking back over the things that I’ve written about the workshop so far, I do realize that they’ve taken on a wifty, abstract quality. Saying things apparently in order to say nothing at all. It isn’t intentional. I’ve tried not to. I’ve tried to be more factual, and less fantastic, but it doesn’t seem possible for me just now to convey the sense of wonder, and of joy, that I’m experiencing first hand with my fellow travelers into a world seldom seen by 外国人. So, it has become less of a travelogue, and more a set of reflections. Things I saw greatly overshadowed by the things I felt. Rather than being able to say “We were here. We did this.” Forgive me, if you would, I think if you were here you’d feel the same way. 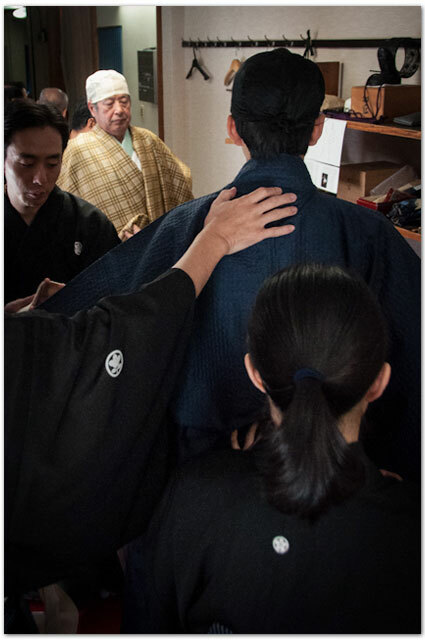 This entry was posted in Costume Workshop, Workshops and tagged 2014 costume workshop, 福山, examining details, fukuyama, Noh Training Project, Oshima Kinue, Oshima Teruhisa, theatre nohgkau, understanding, 大島, 一期一会, 佐々木能衣装. Bookmark the permalink.